Conjugating verbs is probably one of the most difficult aspects of learning any foreign language. When I learned Arabic, I took classes for only three months but that was enough to give me a basic idea of verb patterns. From there I was able to continue learning the language by listening to it being spoken around me; it is relatively easy, for example, to increase your vocabulary by looking up nouns and adjectives in a dictionary. Bescherelle is the definitive guide to conjugating French verbs in all their tenses. You might expect a guide covering twelve thousand verbs to be a huge heavy tome, but it is a small format and has just 174 pages, thus light enough to carry around with you. It is divided into three main sections: grammar of the verb, conjugation tables, and a dictionary of the spelling of verbs. Whilst it may sound like one of the most boring books ever to be published, it is a mine of information that could make you realise how much there is still to learn. The first section on grammar of the verb covers how verbs are divided into three main groups, agreement of the verb with the subject, and agreement of the past participle. Although only seven pages long, this section clears up potentially tricky points, such as the fact that the verb has to agree with its subject, except when the subject is qui, so in French we say ‘c’est moi qui suis descendu le premier’, which differs from English. The tables of conjugation begin with some general ones covering avoir, etre, passive voice, reflexive voice, one for all the endings of the three groups, and finally active voice. After this there are thirteen tables for verbs in the first group (ending in -er), just two for the second group (ending in -ir), and then sixty-two for the third group, which includes verbs ending in -ir/ant, -oir, and -re, many of which are irregular. This total obviously does not add up to twelve thousand, but verbs that have the same ending and follow exactly the same pattern are listed in any given table. Each table takes up one page and manages to squeeze in more information than any textbook that I have used: eight tenses in the indicative mood, four in the subjunctive mood, two for the imperative, three conditional tenses, two infinitives and two participles. Some tables also include notes at the foot of the page, usually on the way in which compounds of the verb are conjugated; thus there is a note about entrevoir, revoir and prévoir at the foot of the table for voir. At the end of the verb table section is a two-page list of all the verbs in the third group, since so many of them are irregular. Following this is a page on choicc of auxiliary, starting with a list of verbs that can be conjugated with either avoir or être, ‘depending on their precise context or nuance.’ So we would say ‘il est monté à sa chambre’ (he has gone up to his room) but ‘les prix ont monté’ (prices have gone up). This amount of information on a page slightly less than A5 size means that a small font has had to be used, yet the layout is very well organised and there is a clear space between tenses. The first person singular of all but the compound tenses appears in red, as does the tu form of the present imperative. Personally I have no trouble reading anything in this book, although I quite often struggle with information printed on food packaging, for example. The French-English dictionary listing of verbs includes all twelve thousand and shows the particularly common ones in bold type. As well as definitions, it gives the number of the table that shows that verb’s conjugation, the preposition such as à or de governed by the verb (if there is one), and indications of verbs that are reflexive, defective or impersonal. The Bescherelle Guide is a reference book for anyone studying French at GCE Advanced Level or beyond, or for anyone who wishes to speak perfectly correct French without shying away from grammar. It is not a workbook as it contains to exercises, but it tells you everything you would need to know about French verbs. For meanings, it is much easier to look the verb up in the dictionary section of Bescherelle than it is to look in a large, heavy dictionary; a really good dictionary, however, has the advantage of giving examples of the verb used in context. But if you want a book that is light enough to carry around, you will find a better one than Bescherelle. 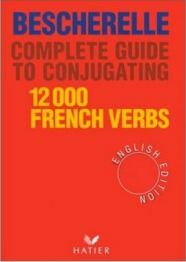 No Comments on "Bescherelle Complete Guide to Conjugating 12000 French Verbs"
« Is it Always Right to Tell the Truth?